Blue & Gold by Constance Brewer 7" x 7" White line print on Stonehenge paper. Daniel Smith watercolors. Updates have been thin on the ground of late because I was pushing to get my latest print done. 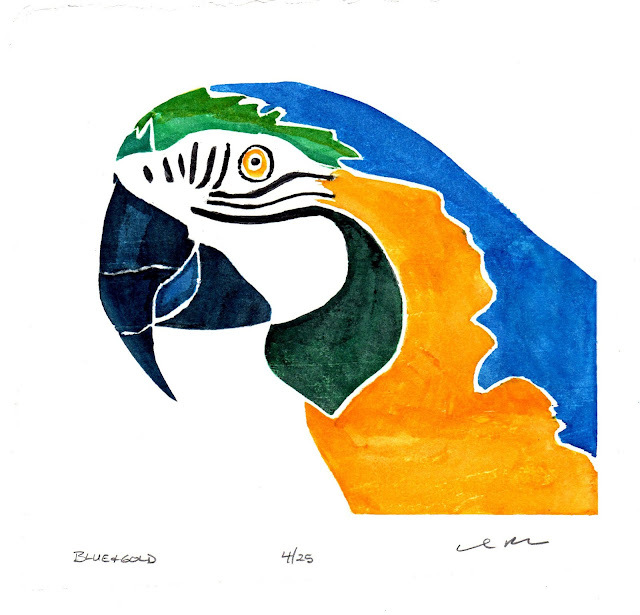 The Blue & Gold Macaw pictured above. It's a bit different from my usual relief printmaking in that it's a white line print. What is that, you ask? How is it different from the usual lino or wood cut block? The following from Jeanne Norman Chase as written in 1999 on the Baren Forum. "White-line woodblock printmaking began in 1915, the first woodblock printmaking unique to the United States. Western artists admired the Eastern traditional type of woodblock printing made by the Japanese artists. The Eastern art form required several blocks of wood to produce a finished print. The Western printmakers of 1915 created their own style of woodblock printing using only one block of wood. The method started with a group of six artists in Provincetown, Massachusetts and this new form of woodblock printmaking became known as the Provincetown print, or white-line woodcut. Their work has been exhibited worldwide, and recently at the National Gallery of Art in Washington DC. The registration was uniquely different since only one print at a time would be printed. The side of the paper was tacked to the board and folded back, in the same way that a book would open. This would keep the registration lined up at all times and the print could be left while other prints were inked. The paper is attached to the left edge of the block with thumbtacks, then gently folded back. This makes the register. The paper is repeatedly lifted and printed so this method keeps the paper in constant register. The lines are cut into the block with a V-shaped cut of the knife. The lines remain white in the finished print, as only the raised areas which are left receive any color. It is a relief print in reverse. To print a color, mix it alone on a palette. Apply the paint to the area (or areas) that you intend to print. Fold the paper down on top of the block and rub very gently over the inked area with the wooden spoon." This method takes a while. I started working on the prints in August, figuring I would have plenty of time to do 20 prints before the Oct. 31 deadline. Here it is the 15th and I'm just getting done. I had to learn on the first few prints to put enough color on first time. My prints were coming out too light otherwise. I also found that I couldn't do more than two prints in a sitting, because the woodblock would retain the wetness and cause some areas to spread. I also decided next time I did this I would a) cut the lines deeper b) use a bigger woodblock, and c) only make 4 or 5 prints. Since this was for a Baren Forum Exchange, I needed to make 20 prints to exchange with the other participants. I'm going to get 19 other white line prints in the exchange, how cool is that? The extra print goes to Pacific Northwest College of Arts (PNCA) in Portland, Oregon to be archived. I love these print exchanges because I get so many prints from artists around the world. I study and learn from them. If you'd like to see some of the exchanges, go to the Baren Exchange Gallery and click on any of the active links. Some outstanding work there. Now, onwards to more prints, and some 'Underground' work for the Gyroscope Review cover. Art never rests. I'm glad art never rests! Love the macaw. Thanks! More bird prints in the works, as you saw. If you need a live bird for a model,I can ship you one fast and free of charge. I thought Birdy Kreep found new digs?? The "Kreep" has worn out half his welcome at his new home.